A combined team from Acme and Strathmore won Silver Medals in the Canada Senior Games held in Brockville, Ontario from August 25-28, 2010. They played in the 65+ 5-Pin Bowling category. Pictured abover are Gail Galusha of Strathmore, Peter Snyder of Acme, Doreen Boake of Acme, Helen & Pius Sauverwald of Strathmore. Kevin Kubinec's team, "The Cardinals", are the Kneehill Slowpitch League Champions. The B Side final winners were the "Grey's Anatomy" from Huxley, and the C Side final winners were "the Heat" from Three Hills. 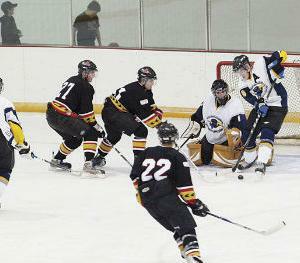 After a good competitive training camp, the Three Hills Thrashers hit the ice this week for a string of exhibition games.